The first technology to use centrifugal energy to clean electronic circuit assemblies, precision parts, and semiconductor pacakges. The system offers unparalleled penetration, solubilization, and contaminant removal. The centrifugal energy, generated when parts are rotated in a sealed process chamber, produces results unattainable through any other available technology. Products cleaned in the MicroCel system are held in place and secured to the head using either universal adjustable fixtures, standard fixtures, or customer fixtures to your product type. 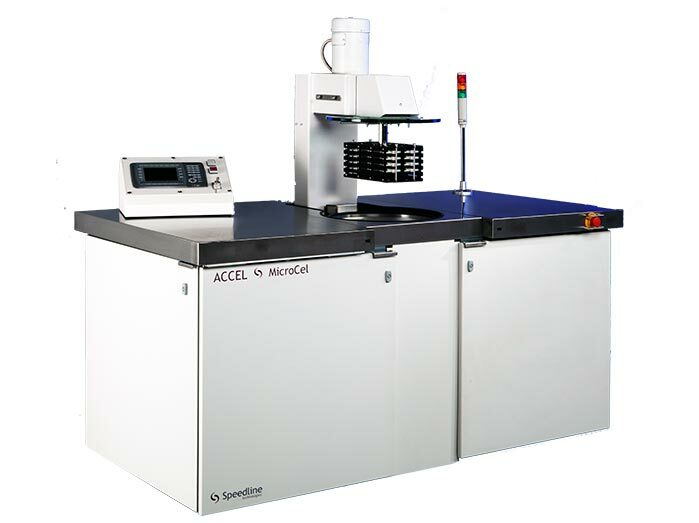 The MicroCel Centrifugal cleaning system provides high-performance, complete cleaning of electronic circuit assemblies, precision parts, medical devices, wafers, and advanced packages including flip chips, MCMs, SIPs, BGAs, CSPs, and hybrid electronics. Centrifugal energy, produced when parts are rotated inside a sealed process chamber, provides thorough penetration, solubilization, and contaminant removal when couple with appropriate cleaning chemistries. 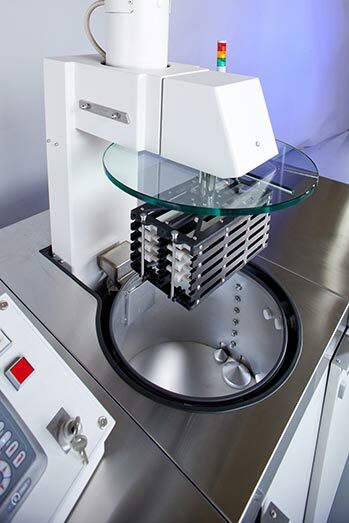 Products cleaned in the MicroCel are held in place and secured to the robot head using either universal adjustable fixtures, standard magazines/carriers, or custom fixtures specific to the product type. With today’s uncertainty about tomorrow’s solvents, the risk in buying a cleaning system is high. Expensive new equipment may quickly become obsolete when a change is made in the choice of cleaning solutions. The MicroCel is the only system currently available that can handle most cleaning solutions, include DI water, saponified solutions, semi-aqueous solutions, detergents, alcohol-based solvents, and terpenes. By any measure, e.g., ionic, SIR, or visual, cleaning results produced by MicroCel technology exceed all others. Ionic contamination of 0.00 micrograms/inch2, surface insulation resistance greater than 1014 ohms/ince2and with no visible residue at 45X magnification upon component removal are typical cleaning results. The MicroCel zero-discharge system is an automatic, on-board, closed-loop, fully integrated waste water treatment system. When using solvents that separate from water, the zero-discharge system automatically removes from the used rinse water and returns the wash solvent to the wash reservoir for reuse. The used rinse water is then processed through the four-stage purification process, including microbial control, 5-micron filtration, carbon adsorption, and mixed bed deionizing resin to restore the rinse water to is original purity level. 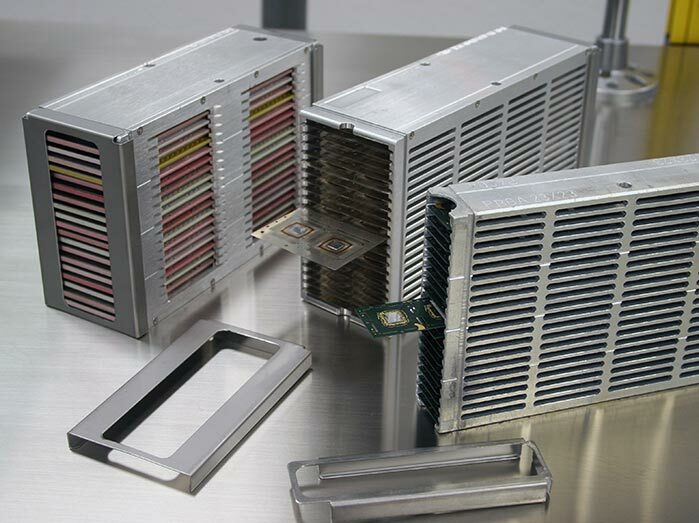 The MicroCel is commonly installed in clean room environments that are common for medical and semi-conductor manufacturing.